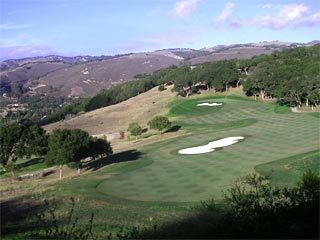 Carmel Valley Ranch Golf Course was designed by Pete Dye and opened in 1981. Located in Carmel Valley at the foothills of the Santa Lucia Mountains, Carmel Valley Ranch offers a wonderful golf adventure. 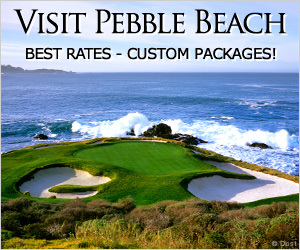 Located on over 400 acres of sun drenched valley terrain, this is the only course on the Monterey Peninsula designed by Pete Dye. Topographically, this layout is very challenging with many raised and sunken greens through the hills, making club selection crucial. The front nine is positioned along the beautiful Carmel River featuring very tight fairways and tricky greens. The back nine is situated 350 feet above the valley floor among the knolls of the national forest, offering some of the most breathtaking elevated tee shots in all of Monterey. The vistas on the tee box of #11 offer picturesque panoramas of the valley below. Positioned in the midst of the Santa Lucia Mountains, you are bound to see some wildlife, with quail, turkeys, rabbits and foxes abound. Water comes into play on several holes and well-guarded multi-tiered greens force you to stay on top of your game to score well. Destinations Magazine ranked Carmel Valley Ranch Golf Course as one of the 25 most challenging courses in the entire state of California. A recent renovation has improved the conditioning and playability of this par-70, Pete Dye course. This 18-hole championship golf course was ranked by Golf Magazine as one of "Monterey's must-plays." Located just a few minutes east of Carmel-by-the-Sea, you can find a warm refuge, away from the brisk coastline. In a survey conducted by their readers, Travel and Leisure Magazine rated the Carmel Valley Ranch as one of the Best Golf Courses in the World.